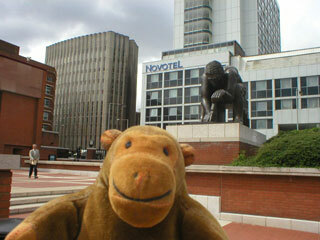 "These are slightly odd sculptures, you know"
The route took Mr Monkey through the piazza in front of the British Library. He paused for a moment to look at Eduardo Paolozzi's statue of Newton, and Anthony Gormley's Planets (which could easily be mistaken for boulders from a distance). 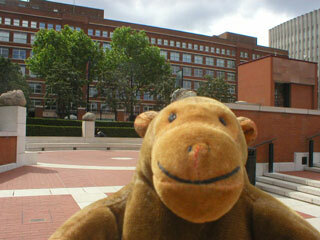 You can read all about the library at the British Library website.